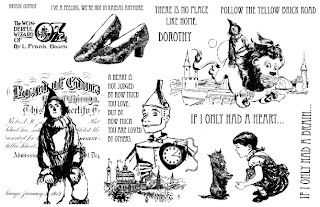 Designs by Lisa Somerville: Artistic Outpost - There's No Place Like Home and a Limited Time Special! Artistic Outpost - There's No Place Like Home and a Limited Time Special! And now for some savings! In celebration of Artistic Outpost's Third Anniversary, all rubber stamps are 20% off from now until November 5, 2010. That includes all unmounteds and mounteds. Simply use the code: Anniversary at check out to receive your discount. The image is stamped in Black Archival on Watercolor paper, then colored using the Marker Watecoloring Technique. I added some clouds in the background by sponging Blue ink over a scallop edge. The Pattern Paper is from the Basic Grey Boxer pad, perfect for this image! love your card using these new stamps! Gorgeous card. 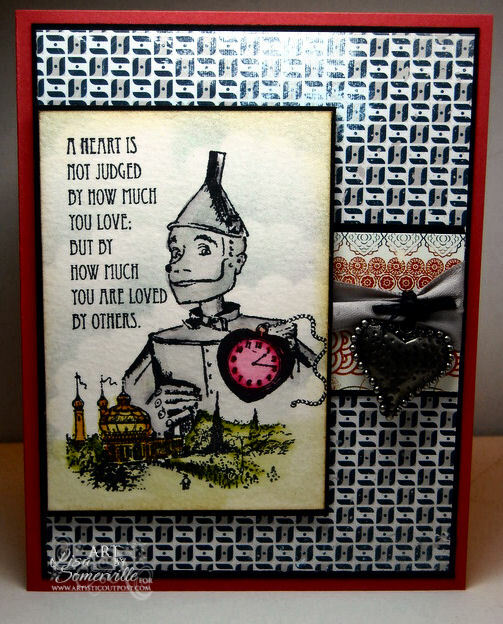 Love the way you colored the tin man. Fabulous! The background paper too is the perfect choice for this image. Love your card - what a great set! He is just adorable, and he has a heart! Beautiful image, luv these stamps! Super cute hun!!! Love the stamps you used, and that beautiful Heart!!! This is so fun Lisa! 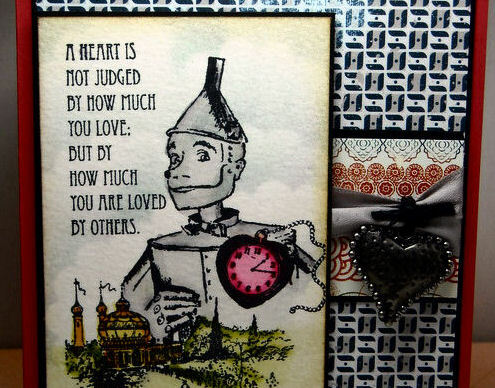 Love what you did with the Tin Man!! Hopefully your day will be storm free!! What an awesome set this is.. Very cute card, I haven't see Oz in years! Love the cloudy background and the pop of the red heart ... fabulous card. This is such a great nostalgic card! Your watercolouring looks great, don't see that much watercolouring now a days and I do like the effect, and that heart pendant ties it perfectly. I love how you added those clouds and that heart, what a perfect finishing touch!